Quail Hill Publishing, 9780692529782, 164pp. Angie Amalfi's wedding-her Big Day-is on the verge of becoming a Big Mess. She had planned every detail of the day with the utmost care, wanting everything to be perfect. But now people across the city are dying to put the wedding on hold. A crazed killer here, a bumped off bride there. In her mind, nothing less than a criminal conspiracy must be at work to keep her wedding from being where and when she wants it. Angie's fiance, San Francisco Homicide Inspector Paavo Smith, the entire SFPD Homicide Squad, her friends and family all jump into the fray to help save her wedding plans. 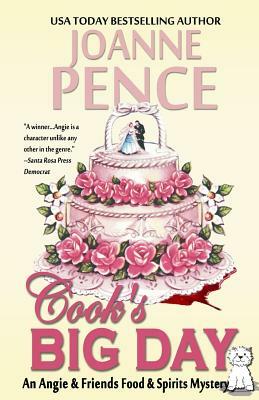 But as dangers and catastrophes grow faster than yeast-overloaded bread dough, Angie can't help but wonder if her Big Day will turn into her Biggest Disaster ever. Joanne Pence is the award-winning, USA Today best-selling author of two mystery series, the very long-running "Angie Amalfi" mysteries, and the new "Rebecca Mayfield" mysteries. She has also written historical fiction, contemporary romance, romantic suspense, a fantasy, and suspense. She hopes you'll enjoy her stories as they present a variety of times, places, and reading experiences from mysterious to thrilling, emotional to lightly humorous, as well as powerful tales of times long past. For more information, visit her at www.joannepence.com.